On September 8, 1995, I flew to Atlanta, Georgia with my sister, Carmela, to attend Joe Weider’s Olympia Fitness Weekend. The trip was a comp, thanks to my brother, Domenic. It was a gift for my 40th birthday, which was the following day. In all my years of training, I had never attended an Olympia competition. I decided this would be a good time to visit bodybuilding’s premier event. More than any other reason, I wanted to see all nine (past and present) Olympia champions take the stage with Joe Weider to commemorate the 30th anniversary of the competition. Although I did not share the same philosophy towards bodybuilding as most of the Olympia winners, I was nevertheless inspired by them during my earlier muscle building days and was eager to see and meet with some of them. The 1995 Olympia Fitness Weekend was more than just a muscle show. It was also the inauguration of women’s fitness competitions to the IFBB. It attracted vendors from the bodybuilding and fitness industry to market their products at the Expo. About a mile from the show, a Marriott hotel housed everyone related to the Olympia Fitness Weekend’s festivities. The Marriott had a lobby area that was encircled by 30 plus floors of guest rooms and balconies. The majority of the hotel was booked with Olympia guests and it must have felt like being on another planet to those that were there for reasons other than seeing bodybuilders flex their stuff. There was wall-to-wall biceps, pectorals, quads, and abdominals every which way you turned. It was truly muscle-heaven for those who were into the hard-core muscle scene. For me the highlight of the weekend was on the 9th. Not only because it was my birthday, but because I got to meet with quite a few big names in the industry for the first time and enjoyed conversing with them about our similar passion in bodybuilding. One fellow in particular I enjoyed meeting was the first Mr. Olympia, Larry Scott. As a teenager, I had always idolized Larry Scott and purchased all of his training booklets to help further my gains. During his prime, Larry had been an inspiration to tens of thousands of young men and at one time was the most famous bodybuilder in the world. While speaking to Larry you could sense his true love for the sport as he went out of his way to spend some time with me to discuss the art of muscle building. Many other past champions echoed that same hunger for the sport that evening, as they too all shared Larry’s deep passion for bodybuilding. No matter what philosophy they followed to make it in the sport, they all shared a common denominator. The sport was in their blood and had brought them all together for this historic Olympia weekend. The day’s events went off without a hitch as the many competitions concluded. Then the time for the big moment had finally arrived. All weekend long, the question was asked as to whether or not Arnold Schwarzenegger would show up. The Mr. Olympia’s 30th anniversary was filled with thousands of spectators who had come to see him. Arnold had been in another state filming a movie. There were doubts if he would be able to break away from the movie set to be with Joe Weider and the other legends onstage for this historic occasion. The theater was packed to the rafters that evening. It was a sold-out event and the crowd was drooling in anticipation of seeing all past and current Olympia champions onstage together for the first time in history. About an hour into the show, the MC walked over to the microphone and announced that Arnold had arrived in Atlanta, and was being escorted to the theater by a police motorcade. After several minutes of entertaining the audience, the MC once again addressed the crowd and told them that Arnold Schwarzenegger was in the building. The fans erupted into a huge vociferous roar that was heard for miles away as the houselights dimmed. One by one, the MC announced all nine Mr. Olympia winners as they took their rightful position on this historic stage; Larry Scott, Sergio Oliva, Arnold Schwarzenegger, Franco Columbu, Frank Zane, Chris Dickerson, Samir Bannout, Lee Haney, and Dorian Yates. The standing-room-only, crazed auditorium was in an uproar. This moment was not to be missed and the best was yet to come. As the nine Olympia champions stood there smiling and waving to the crowd, Joe Weider walked onto the stage and thanked each one for their contributions to the sport. After several minutes of sustained applause, the audience returned to their seats and listened to the words of each legend. 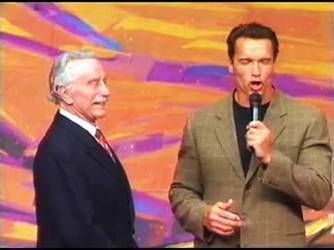 As expected, Arnold stole the show with his humor and antics but for the most part stood respectfully as Joe Weider worked the lineup from Scott to Yates, reflecting on the many good times he shared with each individual champion. As history unfolded, the audience absorbed its true meaning. Onstage were the men who had helped shape the course of bodybuilding history. The men of the Olympia inspired not only themselves but their images and training concepts motivated millions of others over the years. It was a fitting tribute to those iron-men of muscle who thanked the fans for the years of support while they were on their quest to be the best. For me, the weekend was one of those times in my life that I will never forget. Being a bodybuilder from the Iron Age, it was a great way to remember this milestone in my life. My 40th birthday also marked the 30th anniversary of the day my father first introduced me to bodybuilding. So many good times in the sport had passed before me and so many more were yet to be realized. Bodybuilding was in my blood!